Yalda is the last day of autumn, the first night of winter and the longest night of the year. Ancient Persians, believing that Yalda's night will blossom with the sun, the days become taller and the glare of the divine light increases, celebrated the end of autumn and beginning of winter calling it the birth of the sun. Yalda or shabe-cheleh is the last day of autumn, the first night of winter and the longest night of the year. Ancient Persians, believing that Yalda's night will blossom with the sun, the days become taller and the glare of the divine light increases, celebrated the end of autumn and beginning of winter calling it the birth of the sun. This celebration is in the Persian month "Dey"(from 11th December to 11th January), which was creator’s name before Zoroastrians and later became known as the Creator of Light. The light, the day, and the brightness of the sun are signs of the Creator. While the night, the darkness and the cold are signs of evil. Seeing the constant changes of night and day made people to believe that night and day, or light and darkness, are in an eternal war. Longer days were the days of triumph of brightness, while shorter days were a sign of the dominance of darkness. 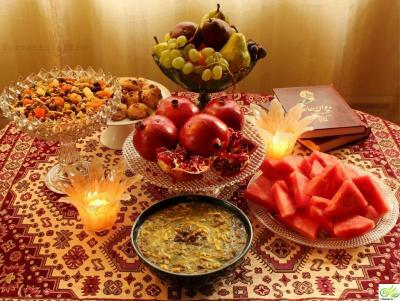 Yalda and the celebrations held this night are an ancient tradition. This celebration is an Aryan ceremony and followers of Mithraism (a mysterious religion in Persia which was based on worshipping the god “Mitra”) have been organizing it in Iran since thousands of years ago. This celebration goes way back to the time when people started to set the seasons. To be safe from the devil, everyone gathered set fire and asked the sun for blessing. The ritual of Yalda night is eating nuts, watermelon, pomegranate, sweets, and various fruits all of which are symbolic and signify blessing, well-being, abundance and happiness. Another favorite and prevalent ritual of the night of Chelleh is fāl-e Hafez, which is divination using the Dīvān (Poems book) of Hafez (a Persian famous poet). People open up divane hafez with good will and happiness and they seek their own horoscope. Yalda is celebrated among Iranians for 7,000 years. 7,000 years ago our ancestors found that the first night of winter is the longest night of the year. Listening to memories and stories of grandparents is also one of the things that make Yalda more attractive to the Iranian family. Yalda is a celebration for families to come together and enjoy the longest night of the year. In different places people have different snacks on this night according to the lifestyle of the people of the region, but eating watermelon is a tradition and very common everywhere in Iran. Many believe that eating watermelon on this night will protect them from the cold throughout coming winter and heat exhaustion during hot summer. People stay up all night and spend the night with family, friends and relatives. Nuts, chickpeas, raisins, colorants, dates, and fruits such as pomegranate and watermelon make up the snacks of this night.